4 Years ago I found out I was pregnant, and before I knew that I was carrying twins, I was interested in the idea of having a water birth. Because twin pregnancies are automatically deemed to be high risk, water birth is not a possibility. 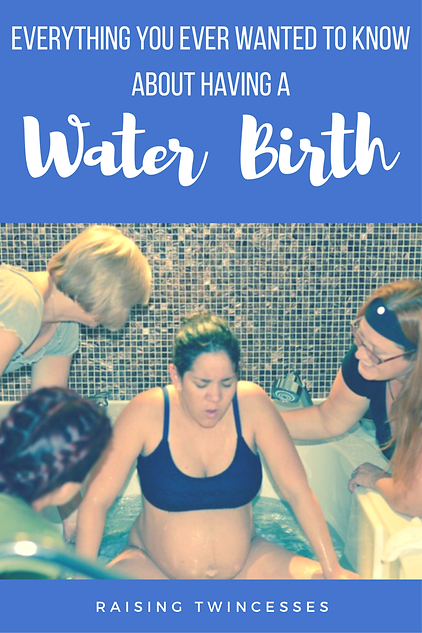 So, when I found out that an old friend I’ve known since elementary school had a water birth, I was super curious and wanted to learn about her experience, which she has so graciously allowed me to share with all of you! I would like to start out my story by saying that no matter how a woman gives birth, whether all natural, medicated, or surgical, she should feel like a hero. Growing and birthing a child is really hard work, and I think all momma’s are amazing. I don’t believe that one type of birth is right, or that how I brought my baby into the world is how everyone else should. Giving birth changed my life, and not just because I became a parent, or fell into a new kind of love with my baby. These life changing things did happened, but it was so much more than that for me. Through my labor and delivery I realized my full potential, and I gained a deep respect and admiration for my body and mind. Before my husband, Ryan, and I got pregnant, I did a lot of research on childbirth- not surprising to anyone who knows me because I have a background in medical research! Through a lot of reading on both scientific and opinion based materials, I decided that I wanted to try to have as natural of a birth experience as possible, and that midwifery care was something I was interested in. Midwives are regulated health professionals here in Manitoba, and in order to become a midwifery patient you must call a general intake line to be placed on a waiting list. There are only 28 or so practicing midwives in Winnipeg, so it was luck of the draw whether I would get one or not. Thankfully, I was placed with a Midwife team right away! I was so excited to get that call, however, I didn’t realize then how lucky I really was. I began seeing my midwives regularly for my prenatal appointments. My midwives treated me like a person, not just a patient and empowered me to ask questions and be a part of my own care plan. I had a few (minor) complications during my pregnancy and they were with me each step of the way-on call 24/7 to see me or meet me at the hospital whenever I needed. My midwives spent a lot of time talking with me about my upcoming birth, and really made me feel like it could be a positive experience. With my midwives approval, I decided to have my baby at the new Birth Centre here in Winnipeg. Not everyone is a candidate for an out of hospital birth- due to some pregnancy related issues I was having, my midwives actually got a second opinion from an OB and I was thankfully given the green light! The Birth Centre is a fabulous place- its really more like a hotel than a hospital, as each room is equipped with a tub, a huge bathroom with a walk in shower, and a double bed. It is fully staffed by midwives and does not have doctors on site. There are no pain medications available at the Birth Centre, however it does have all of the necessary equipment needed for emergencies. I thought the idea of a water birth sounded interesting and I was hoping to be able to use the water for pain relief. I prepared for my upcoming birth like it was going to be the most important day of my life. I took a myriad of supplements including evening primrose oil and raspberry leaf tea, and I had acupuncture done to prepare my body for cervical dilation. Again, all of these things were carefully researched using peer reviewed journal articles- scientific evidence leads me in all of my health decisions! I also read a ton of blogs and books on how to embrace the pain of childbirth and allow your mind to relax and give in to the process (I highly recommend Ina May Gaskins books!). I knew that controlling and shutting off my brain would be my biggest challenge and that I needed to prepare for the fear that’s associated with going into labor and being in pain. Though I had planned and prepared for a natural birth at the Birth Centre I made sure to keep in mind that if I decided or needed to transfer to the hospital for pain medication that would be okay. I also went into my birth fully trusting my midwives and knowing that if they felt like I should transfer to hospital care for any reason then then I wouldn’t hesitate. I think having a solid plan, but knowing that it’s okay if that plan has to change is the key to a good mindset for a natural birth. The most important thing to me was that my baby and I were safe. I went into labor at 4am on September 8th. I was excited and terrified. I called my midwife, Elaine, and she suggested I wait it out a little because it didn’t sound like I was laboring hard yet. So I bounced on my birthing ball and watched TV for a while. By 9am, my contractions weren’t much stronger or closer together, but I called her back anyways. Elaine then decided to come over to check my progress and to all of our surprise I was already 5cm dilated! She said we could take our time and head over to the Birth Centre when we were ready. We did just that and an hour later arrived at the door of the centre and were welcomed by my midwifery team as well as the doula I had hired (a doula’s job is to support you and your partner during your birth!). These fabulous women ushered me in, took my clothing off (for those who have never been in labor- all modesty goes out the window and nakedness is totally acceptable) and helped me into the tub which they had pre-filled and heated. Over the course of the next ten hours or so, I moved between the tub, shower, and bed. I followed the directions of my doula and midwives as I trusted that the positions they were suggesting would truly facilitate the movement of my baby. My birth team kept me focused and continually gave me words of praise, encouragement, and love. My midwife ensured my baby and I were doing well by checking our heart rates every 15 minutes and thankfully there was no need for IV fluids or any other intervention. My team reminded me that each contraction was bringing my baby closer and that I was safe and I believed them. Labor brought the worst pain I have ever been in, and at some points I felt like I was being ripped in half. Many times I wanted to give up but however many times I told my team that I couldn’t do it, my team reassured me that I can, and WAS doing it. Strangely, even though I was in my own personal tunnel of hell I have never felt so grateful and supported. When I finally could not wait to push any longer (my midwife had made me hold back for a good while!) I was given the okay. At this point, I was in the water again as it was where I felt the most comfortable. After only 14 hours of labor and 15 minutes of pushing I delivered my 7.lb 14oz Nova Wilder into a room filled with love. Meeting Nova was the most incredible moment of my life. I brought her out of the water and right onto my chest where she was quickly covered with a blanket so she would stay wet and warm. My midwives were right there to make sure all was well, but at the same time they just let us be together as a family. Nova’s cord was cut eventually by Ryan (we chose to do delayed cord clamping t ensure she received as much of the cord blood as possible) and Elaine took her to be dried off. Ryan was able to do some skin to skin time with Nova while I was being checked over. Because I hadn’t had any drugs, I was able to walk unassisted and have a shower right after giving birth and to be honest I felt pretty good. Ryan and I then climbed into bed with Nova so I could breastfeed. We had some visits from family and then we were discharged to go home approximately 4 hours after birth. Being able to head home right away was wonderful, and my midwives came to visit me every day for the first while to make sure Nova and I were doing well. I still think of my birth almost daily and often reflect on the power that I now know I have within me. My body knew exactly how to birth my baby and because I trusted the process I was able to birth her without fear or hesitation. I feel that my birth experience has given me a new mindset and I now face challenges with more confidence and trust in myself. Of course, it was still a very painful experience- having a baby is painful no matter how or where you do it! But it was a strangely, hellishly wonderful experience and I can’t wait to do it again. What exactly is a water birth? A water birth is basically when you deliver your baby in a tub or pool, so they are essentially born underwater! They do not take their first breath until they reach the surface, but because they still are attached via the umbilical cord they are still getting oxygen into their blood from their mother throughout the delivery. 2. Did you know anyone who had a water birth? I had read a lot of positive birth stories online about water births, but I didn’t know anyone personally! 3. What made you decide to have a water birth? I originally just decided on women centered midwifery care and delivering at the Birth Centre. I thought that a water birth sounded like something I would want but I didn’t specifically plan for that over delivering on the bed, chair, shower etc. 4. Where did you give birth? I gave birth at the Birth Centre here in Winnipeg. This is the only place (other than home births of course!) that you can deliver in a tub. St. Boniface hospital does have a tub for laboring women, but you are not allowed to deliver in it. 5. Who was present during the birth? Ryan, my midwives, and my Doula were the original planned list of attendees. My mom stopped by with food for Ryan and was going to wait in the waiting room (which is equipped with a kitchen, TV, Netflix- seriously the place is amazing!) but when she arrived, I just invited her in! I was so happy I did as it was super special that she was there when Nova was born and she was such a great addition to my birth support team. 6. What are some of the risks involved in a water birth? Water birth, like all childbirth scenarios has risks. One risk specific to a water delivery is that the baby could develop an infection if it inhales water. This can occur if the baby’s head is pulled to the surface before its body, or if the baby is startled during delivery. Midwives are trained to minimize the risk of these things happening and specially prepare and sterilize the tub. There are also very strict regulations on who is a candidate for a water birth in Manitoba. I had a lot of people ask me why I would want to deliver my baby outside of a hospital setting and some people called me crazy for taking such risk. Interestingly, many studies show that out of hospital births (either at home or at a birth centre) have less adverse outcomes than those done in a hospital. I feel that those who questioned my choices likely did not understand the safety measures in place at the Birth Centre –midwives have all of the necessary emergency equipment (intubation kits, lifesaving drugs etc.) and are very good at identifying complications before they arise. The Birth Centre also works with Winnipeg Paramedics to practice their emergency hospital transfer procedures monthly and are well prepared to get a laboring women safely to hospital if needed. Childbirth holds risks no matter how and where it takes place! I felt that the level of risk I took by having a water birth in an out of hospital setting was comparable to the level of risk associated with taking drugs to relieve labor pain at the hospital. Overall, I think women need to be educated on their options for labor and delivery and make their own risk assessment. We should respect each other’s choices and allow women to give birth on their own terms without judgement. Also, just for the record, midwives have this same attitude and can deliver women in the setting of their choice (hospital, home, or birth centre) and they are happy to provide pain relief in the form of drugs or an epidural. 7. What are some of the benefits of a water birth? Water is so relaxing! The warm water definitely relaxed my muscles and allowed me to feel more in control during my contractions. I really think that had I not had access to the water, I would have needed to transfer to the hospital for pain relief. There is evidence that laboring in the water can promote more efficient uterine contractions and oxygen delivery, and that the risk of tearing is lessened when you deliver underwater. I didn’t have any tearing and I believe that being in the water (and a lot of luck) definitely helped prevent it! 8. What was the worst part of the water birthing experience? There really wasn’t a worst part about delivering in the water- maybe the midwives making me get out to take a short walk and go pee every hour or whatever the determined time point was. That sucked because I really didn’t want to move, never mind get out of the tub and be cold and wet! 9. What was the best part of your water birthing experience? The best part was the fact that I didn’t have any tearing or require any stitches! I believe that the warm water definitely helped prevent this- although my supplements and careful pushing direction from my midwives likely helped as well. 10. Would you do it again? Most definitely! Although I would of course keep an open mind as sometimes midwives recommend exiting the tub or changing positions if labor is not progressing or they are not happy with the baby’s heart rate. Do you know anyone who had a water birth? and would you ever consider it? Let me know in the comments! I’ve heard amazing stories about water birth. When I was pregnant, a friend told me about this, and I really like the idea of waterbirth but on the other hand I was scared too. If I was more informed, I would have done it. Thanks for sharing this great story! I have a friend who is getting ready to have a water birth any day now. I would love to have a water birth. This is so fascinating to me!!! i love all the different ways we can bring life into this world. Thanks for sharing your friends story Samantha!! This is really cool but sounds really painful.. i don’t know how pain i maybe able to take in so i may have to opt for an epidural.. I love reading birth stories! What a beautiful birth 🙂 I also wanted a water birth but ended up being induced due to high blood pressure and low platelets… no way they were going to let me in the water! I’ll see how it goes for next pregnancy, I might be considered high risk. Super interesting to read. It’s something I would never do, but it’s very cool to see and read about the process! Kudos to delivering a healthy baby wherever and however it happens! What a fantastic read! I ended up in an emergency c-section with my first, so I won’t ever be a candidate for a waterbirth away from the hospital–but I so, so wish I had been. This always seemed like the most peaceful way to labor. This is so cool to read. I wanted a water birth but ended up having to be induced and then having a C-section. I love it when people are able to have the types of births they plan for. I also had a water birth! It was so hard and like you said.. very painful but I am proud of myself for it and loved the calming effect of being in water in my own space!